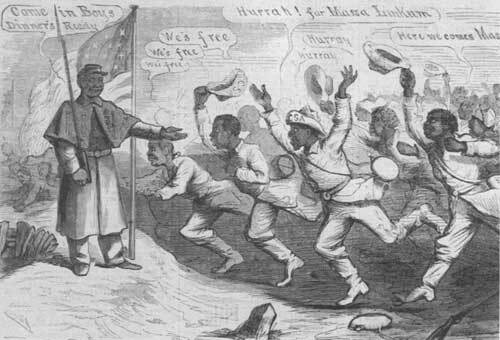 Throughout the first three years of the war, several Southerners had suggested that the Confederacy enlist black men. The Confederate government viewed such proposals as extremist and flatly rejected them. Late in the war, as Confederate ranks dwindled, voices calling for the enlistment of African Americans grew louder and louder. Late in the war, as Confederate ranks dwindled, voices calling for the enlistment of African Americans grew louder and louder. Despite slavery's centrality to secession, these whites realized that the Confederacy must use its resources optimally, and one of those resources was slavery. By early 1864, Major General Patrick Cleburne, an outstanding division commander, circulated a proposal among some general officers in the Army of Tennessee endorsing black enlistment. They argued that slavery was no longer a strength but "in a military point of view, one of our chief sources of weakness." European nations hesitated to aid the Confederacy in its struggle for independence because of the institution of slavery. Early in the war, slaves had produced foodstuffs for the Confederate armies; now bondsmen ran off to labor for the Union or serve in its armed forces. Meanwhile, Confederate armies barely held their own against overwhelming Federal forces, primarily because these able-bodied black males were forbidden from serving in the ranks. At the time the proposal generated little support. The army commander forwarded the document to Jefferson Davis, and he quashed it. Burt one year later, with the war effort on verge of collapse, Confederate politicians resurrected the issue of black military service. The argument was heated. "Use all the negroes your can get, for all the purposes for which your need them, but don't arm them," urged Georgian Howell Cobb to the secretary of war late in the war. "The day you make soldiers of them is the beginning of the end of the revolution. If slaves will make good soldiers our whole theory of slavery is wrong." Others pleaded for legislation that would draw black men into the fight on the Confederate side as a practical matter. The armies desperately needed troops, and they could fill that void. These politicians valued an independent Confederacy more than slavery; anyway, unless the Confederate army filled its ranks, the Union forces would crush the secession movement and with it the institution of slavery. Back and forth the debate raged. The decisive opinion, though, was Robert E. Lee's. The general endorsed black enlistment. Without the infusion of manpower the Confederate armies could not last much longer. The Union had employed black troops with some success, Lee noted, and he believed they would make "efficient soldiers" for the Confederacy. When the war ended, the Confederacy was organizing its first black units in Richmond. They never saw combat. Yet the importance of the decision indicates how strongly the war and the performance of black soldiers in the Union army had affected Confederate attitudes.